The Chrysler Building was designed by architect William Van Alen for a project of Walter P. Chrysler. When the ground breaking occurred on September 19, 1928, there was an intense competition in New York City to build the world's tallest skyscraper. Despite a frantic pace (the building was built at an average rate of four floors per week), no workers died during the construction of this skyscraper. The Chrysler Building is considered a masterpiece of Art Deco architecture. The corners of the 61st floor are graced with eagles; on the 31st floor, the corner ornamentation are replicas of the 1929 Chrysler radiator caps. The building is constructed of masonry, with a steel frame, and metal cladding. In total, the building currently contains 3,862 windows on its facade and 4 banks of 8 elevators designed by the Otis Elevator Corporation. The building was declared a National Historic Landmark in 1976. 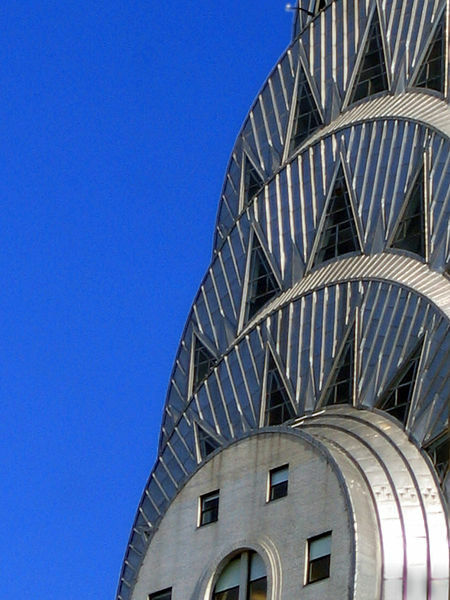 The Chrysler Building is also renowned and recognized for its terraced crown. Composed of seven radiating terraced arches, Van Alen's design of the crown is a cruciform groin vault constructed into seven concentric members with transitioning setbacks, mounted up one behind another. The stainless-steel cladding is ribbed and riveted in a radiating sunburst pattern with many triangular vaulted windows, transitioning into smaller segments of the seven narrow setbacks of the facade of the terraced crown. The entire crown is clad with silvery "Enduro KA-2" metal, an austenitic stainless steel developed in Germany by Krupp and marketed under the trade name "Nirosta" (a German acronym for nichtrostender Stahl, meaning "non-rusting steel"). When the building first opened, it contained a public viewing gallery on the 71st floor, which was closed to the public in 1945. This floor is now the highest-occupied floor of the Chrysler Building, it was occupied by an office space management firm in 1986. The private Cloud Club occupied a three-floor high space from the 66th–68th floors, but closed in the late 1970s. Above the 71st floor, the stories of the building are designed mostly for exterior appearance, functioning mainly as landings for the stairway to the spire. Very narrow with low, sloped ceilings, these top stories are useful only for holding radio-broadcasting and other mechanical and electrical equipment. William Van Alen was born in Brooklyn, New York, in 1883. He attended Pratt Institute in Brooklyn while working for the architect Clarence True. He also studied for three years at the Atelier Masqueray, the first independent architectural atelier in the United States, founded by Franco-American architect Emmanuel Louis Masqueray. Thereafter, Van Alen worked for several firms in New York, notably working on the Hotel Astor in 1902 for Clinton & Russell, before he was awarded the Paris Prize scholarship in 1908. The scholarship led to his studying in Paris, in the atelier of Victor Laloux at the Ecole des Beaux-Arts. When Van Alen returned to New York in 1911, he formed a partnership with H. Craig Severance. The partnership became known for its distinctive multistory commercial structures. Their friendship grew strained over time, and eventually the partnership dissolved. Thereafter, both Severance and Van Alen continued to practice on their own in New York. In the late 1920s, both architects found themselves engaged in designing buildings that were heralded in the press to become the tallest buildings in the world: Severance, the Manhattan Trust Building 40 Wall Street and Van Alen, the Chrysler Building. At 1046 feet, Van Alen's building won. However, both buildings were surpassed in height by the Empire State Building in 1931. The completion of Chrysler building was received by critics with mixed reactions. Van Alen was hailed as a "Doctor of Altitude" and as "the Ziegfeld of his profession." However, the building itself was described by some critics as just flash which "embodies no compelling, organic idea" and which was "distinctly a stunt design, evolved to make the man in the street look up" but having "no significance as serious design." Nevertheless, the Chrysler Building remains a beloved New York City landmark structure. Unfortunately, Van Alen had failed to enter into a contract with Walter Chrysler when he received the Chrysler Building commission. After the building was completed, Van Alen requested payment of 6 percent of the building's construction budget ($14 million), a figure that was the standard fee of the time. After Chrysler refused payment, Van Alen sued him and won, eventually receiving the fee. However, the lawsuit significantly depreciated his reputation as an employable architect. His career effectively ruined by this and further depressed by the Great Depression, Van Alen focused his attention on teaching sculpture. The Blog Tour deadline is December 28th. Winners will be randomly chosen from all the qualifying entries on December 1st. Our sponsors this month are Beads of Clay and Nunn Designs. From all the entries during the month, an editor is going to pick their favorite design to be featured every Monday here on the ABS. We want to give our participants more time in the spotlight! Our Featured Designer will be this Monday, so get those entries in soon. Please add the tag or title DEC ABS to your photos. Include a short description, who created the art beads and a link to your blog, if you have one. Deadline is December 31st. Photos are approved by our moderators, if a photo hasn't followed the guidelines it will not be approved. You may upload 2 photos a day. Oh I love the idea of a challenge inspired by a wonderful iconic building such as this! I'm putting on my thinking cap now. I just want to make sure I understand. Would a bead/pendant made with metal clay be considered an art bead for the challenge? I love your ornaments! Snowman have always been my favorite! Just beautiful! I cannot believe I got my post up already! WooHoo! I am on the ball this month. Okay here's the real reason, I knew I'd forget come the holidays, lol. Thanks so much Heather. I wasn't sure. I really love the inspiration for this challenge and have been trying to think of something to make. I've never entered one before. LOVE this month's inspiration for the challenge! I have been in that building and I know someone who works there. So I felt compelled to do this challenge. Tried to add to the Flickr group, but think I goofed in the process.